Grasses aren’t everyone’s cup of tea but I have to say that in terms of planning an effective and interesting garden I wouldn’t be without them. Ornamental grasses usually flower in the autumn and often retain their attractive seed heads throughout the winter. Some of them are even evergreen! Planted in amongst shrubs and perennials you will always be able to find a grass that will fill the space you want however big or small that may be. Grasses are very useful in any mixed herbaceous and shrub border to help provide year round structure and interest. Mass planting over a large area and running a line of grasses along a path perhaps in between garden lights can look very attractive too. My favourite and the one I find most versatile to use is Stipa tenuissima. It’s like a ponytail swishing around in the wind and is a great all round grass. 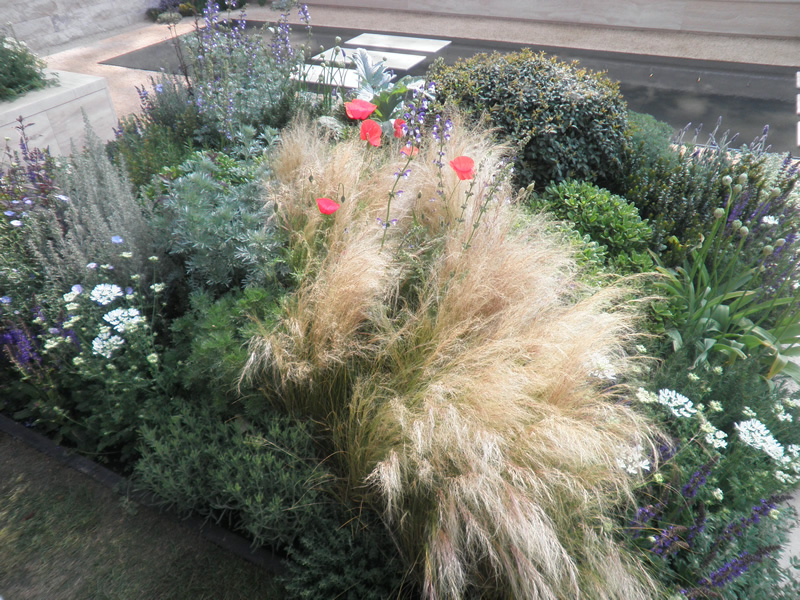 If you have a windy garden then grasses are a great asset. By ‘swishing’ in the wind they create movement in the garden which contrasts nicely with more clump-forming perennials. If you have a corner garden perhaps in front of your house, grasses can provide you with a low maintenance, eye-catching choice of plant here. Festuca glauca is a lovely blue grass. Needing full sun and being relatively low growing, this is a regular choice by my clients. 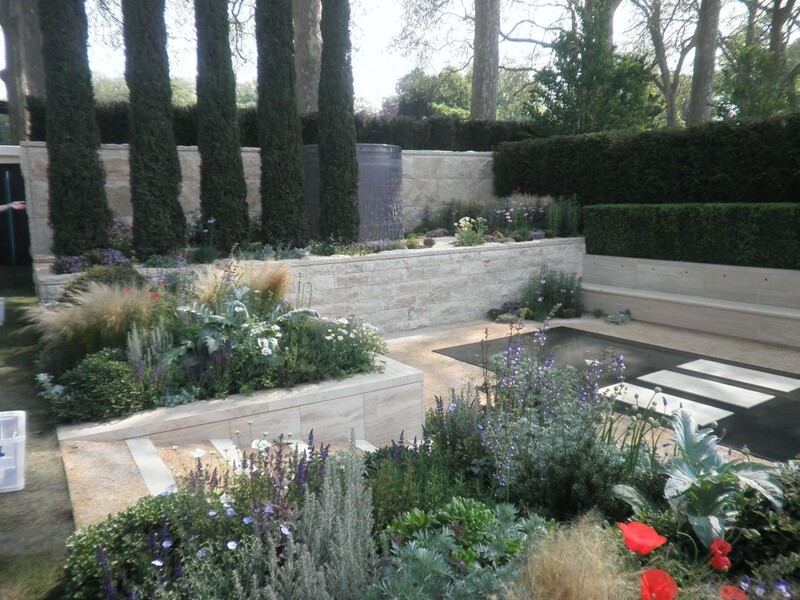 It contrasts beautifully with pinky or terracotta coloured sandstone paving but can be used with almost any colour successfully. It looks fantastic in large drifts. Although most grasses need full sun all is not lost if you don’t have a sunny garden. One of my favourites for shade is Luzula nivea. It has flatish heads of white flowers on narrow stems over evergreen leaves and edged by white hairs. I’ve used it successfully in damp basement gardens so one to bear in mind if you want a grass for a tricky spot. Grasses are definitely one of the easiest plant groups to care for. If you are looking like most people for a low maintenance garden then these are a must. I’d recommend planting in spring as planting before that runs the risk of their roots rotting while sitting in wet winter soil. Spring is also the best time to propagate them. You can lift and divide large clumps by splitting them using two large forks back to back to pull them apart and plant in small sections. If you’d prefer, most grasses can be easily propagated from seed, either by letting them self-seed or sowing seed fresh. A lot of people are unsure when to cut back grasses, but my advice would be to leave it until the last minute. Grasses are beautiful through the winter especially when frost and even snow settles on them. The deciduous varieties can be cut back about 10cm in early spring and evergreens like a light trim in late spring. You can also give them a light feed with chicken manure in spring to encourage plenty of fresh growth.